Spike Lee and Toni Morrison are two of my students’ favorite authors. Of course, their inclusion on our syllabus is not without controversy. For instance, Morrison’s beloved “Peeny Butter Fudge,” a collaboration with her son Slade, includes a recipe on the last page, and my students really want to make it. While there are no peanut allergies in my class this year, the recipe is much too sugary. 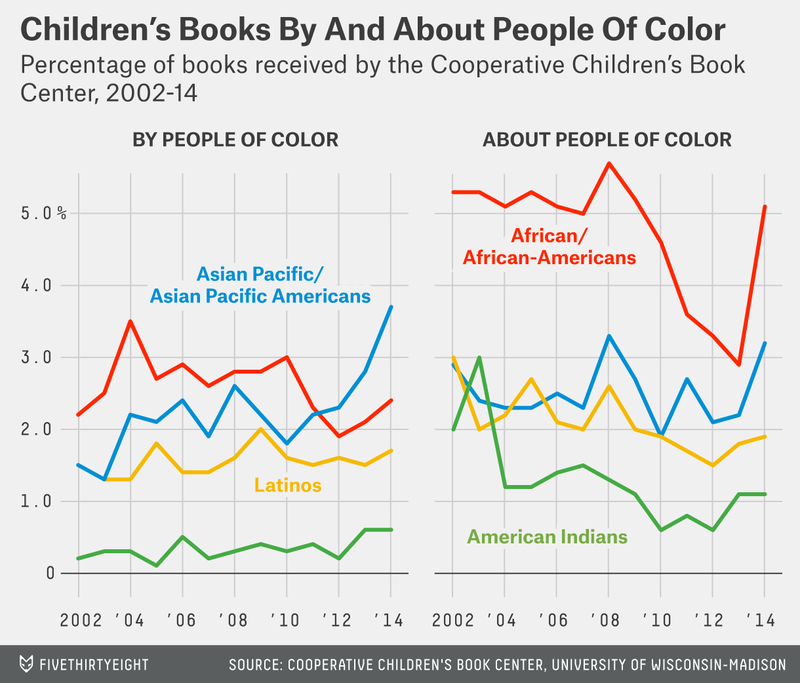 Annual statistics from the Cooperative Children’s Book Center bear out what I know from visits to my local library. For three decades, the librarians at the center, a modest outfit at the University of Wisconsin, have tracked one dimension of diversity in books for children and young adults: racial diversity. Children’s and young adult literature (“kid lit”) represent a stubbornly white world even as U.S. children are increasingly people of color. In any given year, the number of books about one racial group would go up slightly while the number of books about another group decreased. However, Kathleen Horning, the center’s director, and other advocates for diversity in children’s literature see indications that 2014 might be the year the trends began to change. In February, the center released its newest data, which for the first time showed a year-over-year increase in every category.2 The quantities remain tiny when considered as a percentage of children’s books published in the U.S. It, of course, remains to be seen whether the rise in the number of diverse books published in 2014 is a blip or an upward trend. The efforts of We Need Diverse Books echo those of the Council on Interracial Books for Children, which formed in the 1960s in connection to civil rights work in Mississippi. Indeed, movements to change the faces of children’s literature often come hand in hand with broader social movements. It may be no accident that the year that brought us #BlackLivesMatter also brought us #WeNeedDiverseBooks. Industry experts offer a variety of reasons for the lack of diversity in children’s literature, and We Need Diverse Books is using a multipronged approach to address them. One of the group’s initiatives aims to help change who is sitting at the desks of publishing houses reviewing incoming manuscripts. In 2014, Publishers Weekly’s annual salary survey of the industry inquired for the first time about race; 89 percent of respondents who identified their race said they were white. Authors of color report that the overwhelming whiteness of the publishing industry can mute them. They hear again and again that their characters aren’t relatable, or that their books aren’t child friendly, or that they are for the wrong audience. S.E. Sinkhorn, publicity chair for We Need Diverse Books, said that the organization is in talks with many publishing houses, encouraging them to hire diverse interns, and that grants from We Need Diverse Books will support some candidates who could not otherwise afford to take those internships. We Need Diverse Books is also sponsoring various contests, both to publish first-time diverse authors and to honor new books by those in the field. These efforts stem from the recognition that many diverse authors are already writing but may need help connecting to publishers or, if already published, to wider audiences. The Walter Dean Myers Award will recognize notable books by diverse authors, amplifying those books’ impact and presumably their sales. Sales, of course, are a big issue. “The market for your work just isn’t there” is a line that authors of diverse books say they hear frequently. At the same time, some authors find that their books don’t receive the same marketing push as books by white authors. They also find their books carted off to a separate section of the library, “multicultural literature,” where they stand apart from general interest. Small publishers like Lee and Low have arisen to specifically publish and promote diverse books, attempting to disprove the notion that there’s no market for them. So far, We Need Diverse Books has not made library funding a focus. Instead, in addition to its internship program and writing contests, it’s focusing on amplifying diverse books through publicity. The organization has created toolkits to help librarians select and promote diverse books, established an author visit program to bring diverse authors into classrooms, and begun organizing a Diverse Books Festival to take place in Washington, D.C., in 2016. The librarians at the Cooperative Children’s Book Center have begun surveying review copies of books for 2015. “We are not under any impression that that shift is going to happen immediately, not in the next year, not five or maybe 10,” Sinkhorn said. Still, she said, she’ll be keeping a close eye on the center’s data. The good news is that even a few great books can make big waves in the classroom. Recently, I introduced my students to two titles included in the center’s 2014 data: Katheryn Russell-Brown’s “Little Melba and Her Big Trombone” and Kathryn Otoshi’s “Two.” My students love these stories. They’ve been listening to recordings of Melba Liston’s music and participating in dramatic retellings of “Two.” That doesn’t mean, of course, that they’ll cease their campaign to make some of the Morrisons’ peanut butter fudge. The center has also received requests for data on books about people identifying as gay, lesbian, bisexual or transgender. The organization does not plan to collect such data because it would duplicate the American Library Association’s annual bibliography the Rainbow Book List. The center’s analysis is based on the books it receives each year. In 2014, the center received 3,500 books and estimated that a total of 5,000 children’s books were published. A book can be counted in more than one category — for example, if the author is African-American and the illustrator is Latino, the book would be included in both counts. Likewise, a book about an Aztec family living in Mexico would be considered both “about” American Indians and Latinos. Full disclosure: I gave $35 to the We Need Diverse Books Indiegogo campaign because I need diverse books to help my students know themselves and others.